Now! For NYC records — now!! If you care about keeping access to critical vital records, today is the day to speak out, on the latest battleground where this fight is being fought: New York City. Tomorrow, the 24th of October, is the deadline to submit comments to the New York City Department of Health and Mental Hygiene on a proposed rule to close off more access to birth and death records in the Big Apple. If we want these records to stay available to researchers, we have got to speak up. The New York City Department of Health and Mental Hygiene is proposing a new rule that would affect when birth and death records are made available to the public and transferred to the Department of Records and Information Services. 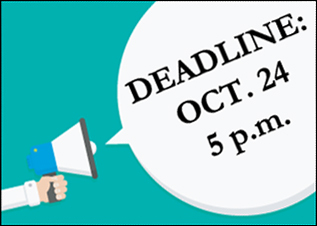 The deadline to submit your comment is October 24, 5:00 pm ET! We’re calling on you to take action and make your voice heard! To keep these historical records accessible to the millions who have New York ancestors, we need to mobilize quickly and act decisively! The NYG&B has prepared an official public comment that sets out an authoritative and well-reasoned argument in support of its position that you can read here. I’ve said it before, but here’s the bottom line: though NYG&B is taking the lead here, it can’t do this alone. It needs the genealogical community — those of us near New York, those of us who research in New York, those of us with ancestors who were ever in New York — to join in. • Get and stay educated: Listen to NYG&B President D. Joshua Taylor speak on this issue — and get yourself ready to speak out yourself. • Attend the hearing: If you’re local or you’re going to be in New York on October 24 when the Department of Health is holding its hearing, be there. You don’t have to say a word. Just be there to show support for records access. And, of course, if you do wish to speak, keep it short, to the point, polite — and on message. • Send a comment: Don’t just sign the petition. Write your own personal letter explaining why this would impact your personal research. Government agencies do pay attention when lots of people speak out. • Get others involved: Send the info about this problem to others you know research in New York City and all those who care about records access. There’s more on the NYG&B action page on how to do this easily. Need more info? The link for more information is here at the NYG&B site. We have One. More. Day. to act on this. The deadline is tomorrow, October 24, by 5 p.m. I finally was able to sing the petition. The website’s form didn’t work under FireFox but when I switched to Safari the form worked correctly and I successfully added my name to the list. Once again NYC is interfering in the lives of New Yorkers. To withhold vital information needed by residence looking up death and birth records of relatives is wrong and none of NYC’s business. Get rid of the “trouble maker” who’s great idea this was. It’s my business, not NYC. I was able to add my name, and to send a separate note. I think I managed to keep my tone of voice calm! They don’t give out data on living people so ….what is the reason? If you are ashamed of those who came before you…Grow up and enjoy having an interesting family. Is there also someone we could call? This is not Europe. I have been researching for 45 years and I am teaching the next two generations how to properly research. We all have the right to know where we come from. As much vital information, others put out on the web and you are concerned with a birth or death certificate?! Secondly, how does releasing a death certificate hurt anything? People go to cemeteries and research obituaries. Please stop this nonsense. Thank you for spreading the word Judy! Much appreciated! Go get ’em tomorrow, Josh! Fingers, toes & everything else crossed! I hope people will make a particular point of mentioning the need to have access to all the information contained in death certificates, such as the person’s residence address, the names of his or her parents, and the name of the informant who provided the information — all vitally necessary in order to confirm the identity of the deceased person. How many John Smiths die each hear in each of New York City’s five boroughs? With just a name and a date of death, how is anyone going to be able to tell them apart?